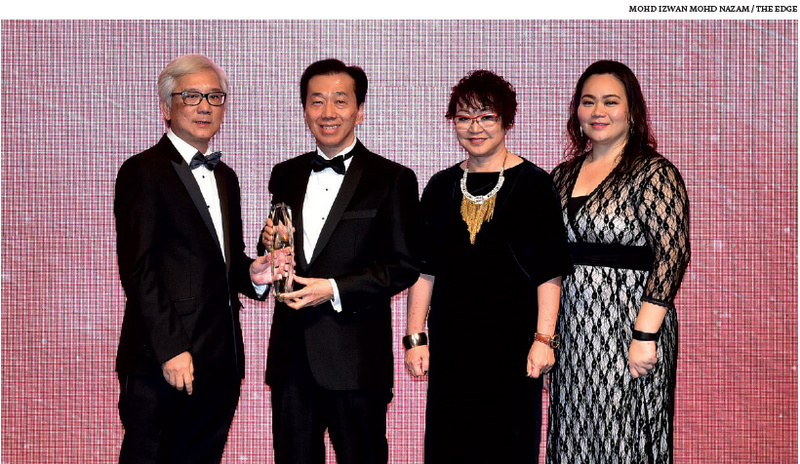 The Edge Malaysia Property Excellence Awards (TEPEA), which recognises industry excellence, celebrated its 15th anniversary at a gala dinner on Oct 30. The 2017 edition was made all the more meaningful by the presence of Tan Sri Ong Ka Ting as our guest of honour as he had presented our first awards in 2003 and every subsequent one until 2007 as the housing and local government minister. We honoured Ong with the Outstanding Contribution to the Housing Industry Award in recognition of his work as the housing and local government minister between 1999 and 2008. Ong oversaw a period of strong demand for housing after the 1997/98 Asian financial crisis. To ensure adequate supply, he initiated changes to speed up regulatory approvals without compromising protection for house buyers. Among others, he introduced a one-stop centre for approvals, the Property Management and Maintenance Act and the National Housing Tribunal to hear claims made by house buyers against developers. It was amidst the robust growth in the real estate market that our then City & Country editor Au Foong Yee, who now heads our property portal edgeprop.my, decided to start a ranking of developers to enable the public to identify those that showed consistent financial strength and delivered quality products to their customers to be used as a home or an investment. We wanted to set a benchmark to guide homebuyers and investors. In the process, we believe the awards have also become a benchmark for property companies to strive for excellence. Today, the awards are much coveted because the vigorous judging process we use ensures that they are based on merit. It is worth noting that we have different teams of judges for the different awards. The judging for the Value Creation Award is done with representatives of the Association of Valuers, Property Managers, Estate Agents and Property Consultants (PEPS). Two judges from The Edge and three from PEPS evaluate and score each submission on three criteria, including the average capital appreciation from the developer’s selling price to the actual transacted price of any subsequent sale of five properties over a period of not more than five years. All submissions must be accompanied by the appropriate documentation. For the Green Excellence Award, we work with Pertubuhan Akitek Malaysia (PAM), which has three representatives on the five-member judging panel. The judging criteria include showcasing innovation beyond the industry standard required, for example, the Green Building Index; design; sustainability; cost efficiency; and relevance to the surrounding community. For the Top Property Developers Awards, we have both qualitative and quantitative evaluation. The qualitative evaluation is done by a panel of industry personalities. Companies are judged by their peers, which is probably the most satisfying way to be recognised. To mitigate the risk of bias, judges abstain from casting their scores for companies where there is conflict of interests. In this evaluation, each company is based on its expertise, image, innovation and creativity, product quality and the value it creates for its buyers. The quantitative evaluation is based on a company’s shareholders’ funds, turnover, profitability and cash or gearing. All property companies listed on Bursa Malaysia and non-listed developers that submit their latest audited accounts to us are evaluated and ranked. In 2016, the combined pre-tax profit of property companies listed on Bursa fell 16% year on year to RM10.22 billion, reflecting the softer market. The overall ranking combines the scores of each company from the qualitative and quantitative evaluations in a 65% to 35% weightage. The scores and rankings are audited by Deloitte Malaysia. We also recognise excellence in large-scale developments that have had a positive impact on the surrounding community as well as affordable urban housing, which is perhaps the single largest challenge facing the property market today. We also present personality awards to outstanding real estate entrepreneurs and professional CEOS for exceptional leadership and performance. This 136-page special supplement provides the details of the awards and the recipients, and photographs of a special evening when leading industry personalities and executives came together to celebrate excellence and each other’s successes.